Purchasing the software License is Not Necessary to Implement the Online Test Software. The Online Test Software can also be implemented on rental basis where the institute has to pay only according to the number of tests solved by candidates. So this becomes a very economical option to start. The system can be upgrade or purchased any time later by paying the difference. Online Test Software Has Both Website & Desktop Interfaces. It is not compulsory for the student to remain connected to the internet all the time during solving the test. The tests can be downloaded into your tab or PC by connecting to the internet for short time and then the candidate can solve the test on his PC/Laptop/Tab and upload it later when done. This saves the cost of internet for those candidates who do not have their own internet connection. This allows to candidate to download and upload the test when he is in the institute, connected to the institute wi-fi and solve the test conveniently at home. The Desktop interface is beneficial even for Labs because it reduces the load on server because the candidates do not have to remain connected to the server all the time. The Online tests can be downloaded onto the Lab computers in short tie and then the students can solve their tests on individual computer terminals without loading the server. Later these test can be uploaded again by establishing server connection for short time. Online Test System can be connected to your website quickly and easily. There is a link and simple piece of code that we provide. This can be added to your website by your web developer team our our team and the software is ready to be accessed fro your website. A website registration interface can be added for external students who come to your website as visitors. The external candidates registering from this interface will get their username and password on SMS or email which they can use to login for demo tests. The institute will receive the information and details of these fresh enquiries directly into their database. The Software is white labelled that means it does not show any branding or signs of Addmen. The software appears to be a part of your website. So this facility can also be used by reseller who are interested to sell their online tet facilities to other institutes. There is possibility to sublet the system by creating many branches or sub-organisations. This facility is good for test agencies or IT service provider individuals who want to resell the online test facility to further organisations with or without their test content. Question paper are uploaded in Word file format. You do not have to enter each question separately in some specific Online Test Software interface. The Question paper can be generated using Question Bank Software or even manually by composing the question paper in a Word file. This file is uploaded into the system and automatically splits into individual question and options. 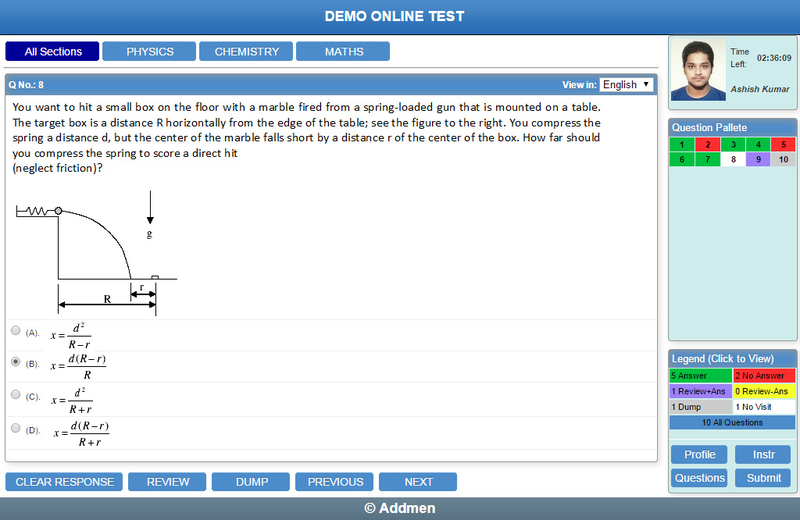 Online Test Questions may contain images, diagram, formula, equation etc. It is possible to upload Question paper in multiple languages and allows the candidate to select the language according to his choice. Each question is split into numerous components and Right click is disabled so that the question content cannot be copied. The online test system is platform independent. The questions are seen clearly on any device Windows PC/Phone/Tab or even Android and Mac machines. Addmen Online Test has an android platform so that the students can take the test on their smartphones. This will make even smaller institutions to implement online test in classroom without investing much money in buying computers. Even if some institutions can buy computers, space is always a problem. The Addmen Online Test Android/Smartphone/Tab interface can be used to solve this problem. The online test system is integrated online with question bank software and OMR Answer Sheet Checker Software. This allows you to create and define your test offline on the administrator PC simultaneously for OMR, Online Test and Android Test Systems. This means that same question paper can be conducted by all three mechanisms and can the results can be clubbed to show consolidated merit lists through online result system on your website.